No names, no pack-drill, but I do find a certain group of showbiz celebs – from gobby pop stars to cringeingly-sincere, hand-wringing screen icons – a tedious bunch of smug do-gooders, overblown with a sense of their own self-importance and, frankly, a bit of a drain on the tear ducts. I might pay good money to admire their professional talents, but I don’t recall ever voting for any of them or agreeing their status automatically entitles them to the god-given right to thrust their opinions down everyone’s throat, particularly mine. As you can guess, the majority of this touchy-feely glitterati dress to the liberal-Left, passionately embracing quazi-political agendas, which can broaden by the week. And, unless you want to be branded an anti-social, neo-fascist loony, heaven forefend you disagree with them, because it’s impossible for them to be wrong. 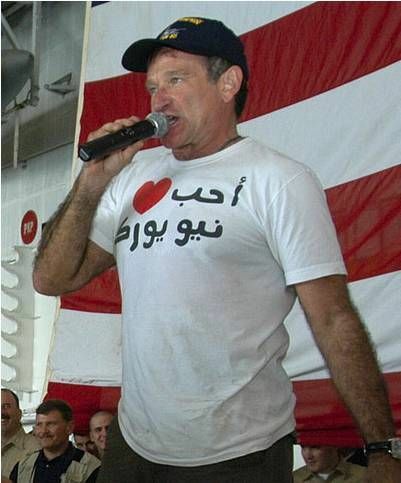 WILLIAMS: The T-shirt logo says 'I love New York' - in Arabic! ‘I see a lot of people yelling for peace, but I have not heard of a plan for peace,’ Williams began. ‘So, here’s one. i) ‘The US, Britain, Canada and Australia apologize to the world for our ‘interference’ in their affairs, past and present. You know, Hitler, Mussolini, Stalin, Tojo, Noriega, Milosevic, Saddam Hussein, and the rest of those good ‘ole’ boys; we will never ‘interfere’ again. ii) ‘We will withdraw our troops from all over the world, starting with Germany, South Korea, the Middle East and the Philippines. They don’t want us there. Instead we will station troops at our borders, so no-one sneaks through holes in the fence. iii) ‘All illegal aliens have 90 days to get their affairs together and leave. We’ll give them a free trip home. After 90 days the remainder will be gathered up and deported immediately, regardless of whom or where they are from. They’re illegal! France will welcome them. iv) ‘All future visitors will be thoroughly checked and limited to 90 days stay, unless given a special permit. No-one from a terrorist nation will be allowed in. If you don’t like it there, change it yourself and don’t hide here. Asylum would never be available to anyone. We don’t need any more cab drivers or supermarket cashiers. v) ‘No foreign ‘students’ over age 21. The older ones are the bombers. If they don’t attend classes, they get a D and it’s back home, baby. vi) ‘The US, Britain, Canada and Australia will make a strong effort to become self-sufficient energy wise. This will include developing non-polluting sources of energy, but will require a temporary drilling of oil in the Alaskan wilderness. The caribou will have to cope for a while. viii) ‘If there is a famine or other natural catastrophe in the world, we will not ‘interfere’. They can pray to Allah or whomever, for seeds, rain, cement or whatever they need. Besides most of what we give them is stolen or given to the army. The people who need it most get very little, if anything. ix) ‘Ship the UN Headquarters to an isolated island someplace. We don’t need the spies and fair-weather friends there. Besides, the building would make a good homeless shelter or lock-up for illegal aliens. x) ‘All Americans must go to charm and beauty school. That way, no one can call us ‘Ugly Americans’ any longer. The Language we speak here is ENGLISH…so learn it or LEAVE. Can’t imagine what the Geldofs, Bonos, ‘Hanoi’ Jane Fondas, Clooneys, Redfords, Redgraves and other celebs with their burning, righteous desire to re-shape the planet according to their will, are going to make of Robin’s rant, but I can guess: for the reasons stated earlier, they’ll brand him as just another, flag-waving, ultra-redneck loony, who should keep his trap shut. Freedom of speech R.I.P.